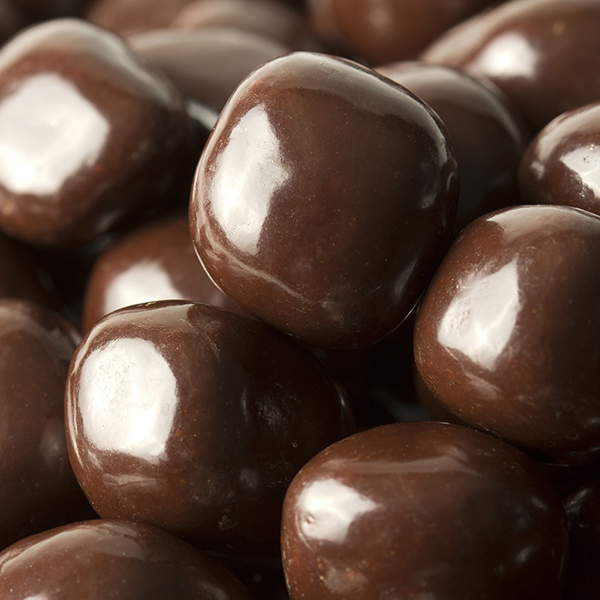 Irresistible flavors of chewy caramels enrobed in sweet dark chocolate. One bite… and you're hooked. NUTRITION FACTS: Serv. Size: About 1/4 cup(40g). Servings: About 6. Amount Per Serving: Calories 190, Fat Cal. 100, Total Fat 11g (17% DV), Sat. Fat 6g (31% DV), Trans Fat 0g, Cholest. 0mg (0% DV), Sodium 0mg (0% DV), Total Carb. 26g (9% DV), Fiber 2g (7% DV), Sugars 18g, Protein 2g, Calcium (2% DV), Iron (8% DV). Not a significant source of Cholest., Vitamin A or Vitamin C. Percent Daily Values (DV) are based on a 2,000 calorie diet. *MAY CONTAIN ONE OR MORE OF THE FOLLOWING: EGG ALBUMEN, PECANS,OR WALNUT; FDA COLORS RED 3, RED 40, YELLOW 5 & 6, BLUE 2, CONFECTIONER'S GLAZE.